We had a fancy to mod our new coupé a little and thought we would add some red brakes ducts to his features, instead of the black ones he was born with. A simple job, just remove the bumper and change the ducts. We have changed bumpers before on CooperBeast, a bit time consuming yes, but not impossible. So yes let’s have a go! 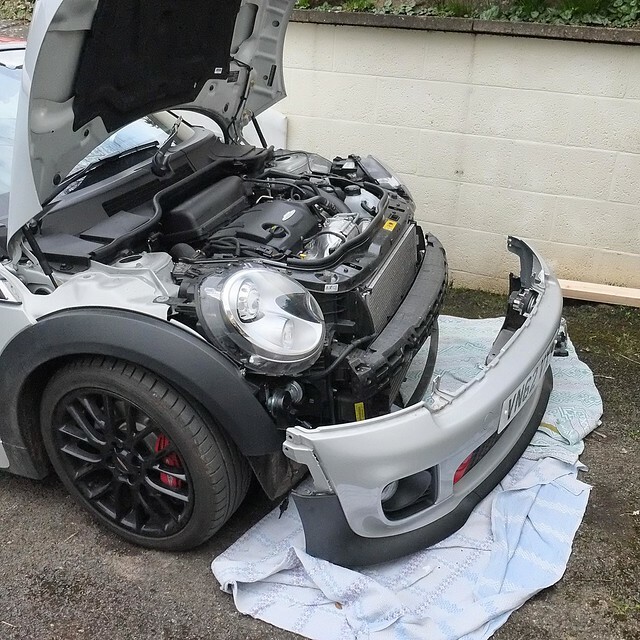 The first problem we encountered was that there are no specific instructions on how to remove a current JCW bumper. R56 bumpers yes and indeed some things are the same, but some things are different. 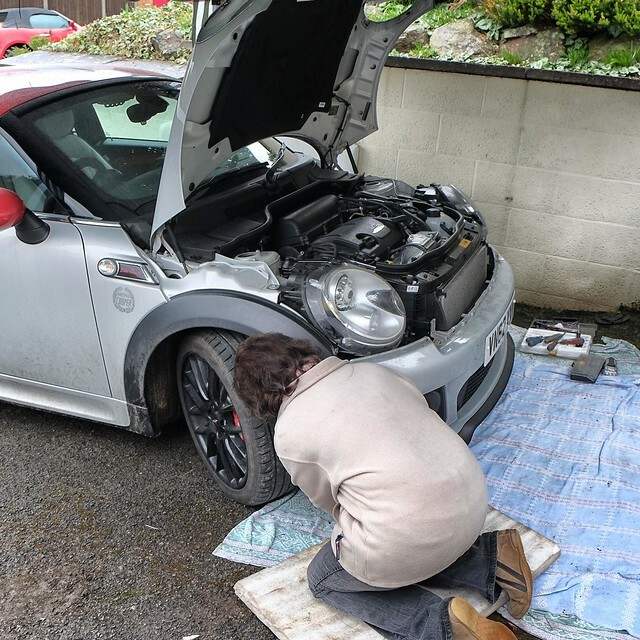 We had some instructions that up to a point were very good – up to the point where the bumper should have come off but was still very firmly fixed on. You cannot simply undo everything that is done up or you will just take the bumper to pieces. At this point we cried for help on the MINI Coupé Facebook page. 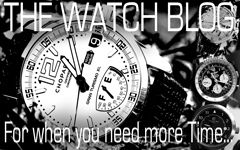 The answer came from our Guardian Angel called Joseph Jost who told us, “Alta’s instructions are old. That is the old JCW bumper. There are 3 small holes at the front underside of the bumper with small fasteners inside.” He was referring to a .PDF file that is available on the internet from Alta, which a number of people had already pointed us to. 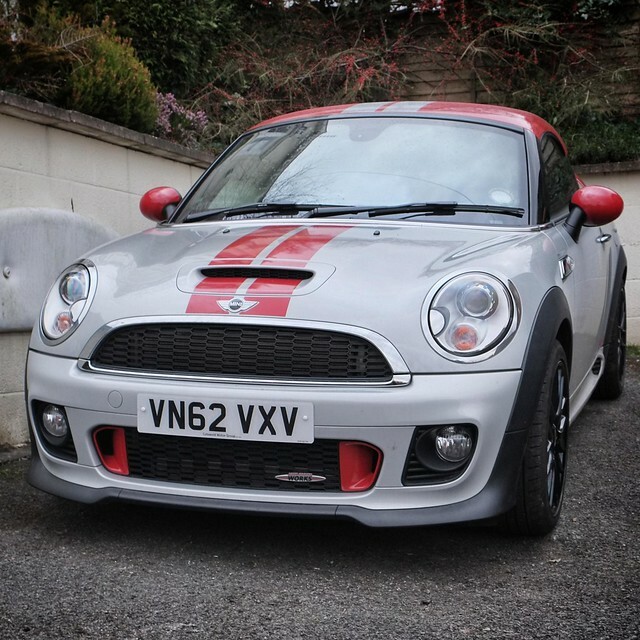 It shows an old R56 bumper and refers to the old JCW bumper. The latest JCW bumper has an additional 3 small holes at the front underside of the bumper with small fasteners inside making a total of 8 fasteners/screws that have to be undone underneath the bumper. The really invaluable help that Joseph gave us was emphatically assuring us that these additional fasteners had to come out. So we sought them out and found them but they were little perishers to get out, It had taken us all of Saturday and Sunday to get to the point where we knew for certain that it was 8 fasteners to be removed. After a tiring weekend we had to admit defeat. On Monday Morning I left for work leaving Peanut with the task “Just have those screws gone, I dont care how but we need them off”. Peanut battled with them for over an hour before using female common sense and getting our tame mechanics from down the road to remove the three fasteners in 5 minutes flat, with long nosed pliers and a big ramp. With these off Peanut returned home, quickly removed the bumper, changed the ducts over and refiitted the bumper, as best she could. When I got back it was a few minutes work to push home the fasteners, that Peanut did not quite have the strength to push home. In honour of the help we received from Joseph Jost on Facebook we have decided that henceforth these ducts will be known as “Joseph Ducts” . Thank you so much for your help Joseph, not sure how we would have managed without your guidance.